﻿ November | 2015 | We're not taking a year off…we're taking on a year. This Thanksgiving weekend, Tiff took some extra days off work so we can drive to southeast Utah, one of our favorite places in the world. The trip will serve as a trial-run for pretirement, though we will be unable to keep our blog updated in the remote corners of Capitol Reef National Park and Grand Staircase-Escalante National Monument. Once we return, we will share photos and stories of our journey on this website. In the meantime, don’t miss a chance to peruse our current travel blog: It’s a Wondon-ful Life. We are thankful that you are taking the time to read about our pretirement plans and hope that you follow us over the next year. Have a wonderful Thanksgiving. Adventure awaits. 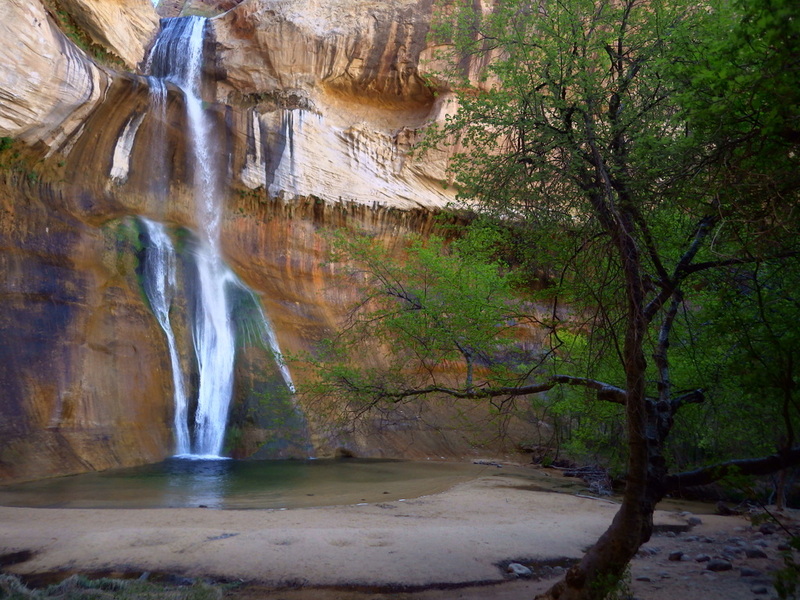 Lower Calf Creek Falls in Grand Staircase-Escalante National Monument in southern Utah. As I explained in a previous blog post, we purchased a used mini-van to serve as our recreational vehicle for pretirement. Since then we have spent a lot of time outfitting it. 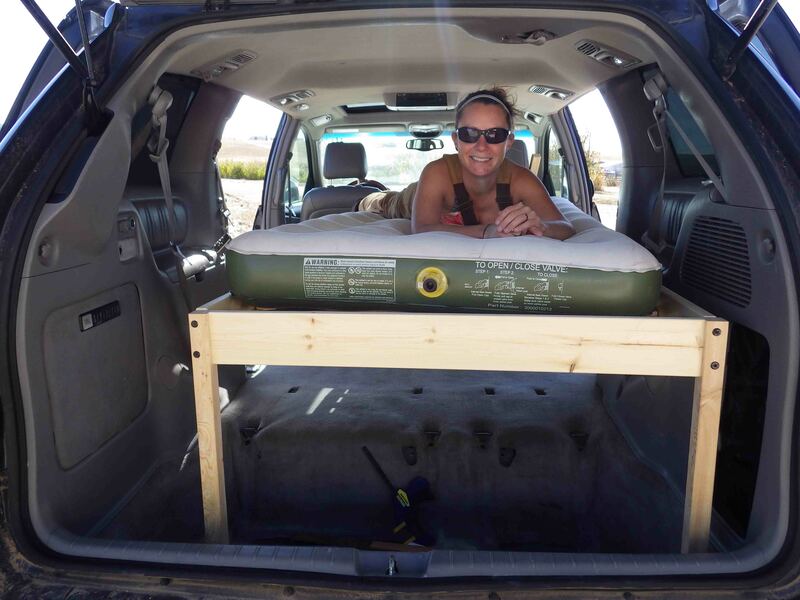 After thoroughly cleaning the inside, we purchased a cheap wooden bed frame then swapped out its four corner posts for custom cut 2×2-inch boards that keep it level on the uneven floor of the van. With an inflatable air mattress and roll-up bed slats, it won’t take up much room when not in use. As you can see in the photo there is plenty of room for storage underneath the bed, especially in the trunk where we removed the stow-and-go backseats. There are a few more improvements to be made before S.N.’s maiden voyage on our roadtrip to Arizona in December. We will keep you posted. Tiff tries out the bed we built for S.N. Like many of us, I have a love-hate relationship with politics. It is especially difficult in a two-party system where neither Democrats nor Republicans seems to represent the majority of Americans that sit somewhere between the polar extremes represented. These differences seem especially pronounced during campaign season, which is already getting old even though the election is over eleven months away. One side benefit of pretirement in 2016 is a lack of contact with a news media that glories in sharing only the worst mudslinging, demagoguery, and blatant racism that is spouted by politicians. I surely won’t miss missing out on this campaign season. Good luck to the rest of you. In 2012, I made the decision to quit my job as a college professor to pursue my passion for creative writing. It was a difficult transition after years of technical writing for biological science journals, but I have produced a non-fiction manuscript about traveling on public lands in the western U.S. that I am currently sending to prospective publishers. I would like to create a companion book that covers the 37 eastern states and that is one reason we are covering so much ground during pretirement. It will also allow Wondon and I to keep expanding our travel blog. At the end of 2016, I would like to write an inspirational book that fully explains the concept of pretirement and offers practical advice on how to follow through with it. I always have fun traveling, but since I became a travel writer I also travel with a purpose. Life is full of uncertainty. I think we can all agree on that. As part of the Millennial Generation, I have heard since I was very young that Social Security would end during my lifetime and that I could not count on that for retirement. The media is constantly drumming up fear of the next contagion, world war, or environmental catastrophe. I am not scared of those things as much as I am afraid that someday I might regret not taking the opportunity to pretire. I know that the world is fairly stable today and I cannot imagine what it might look like in 30 years. Will cross-country roadtrips even be possible if half of the dire predictions for the future come to fruition? I am not willing to take that chance. Plus, gasoline is really cheap right now. You may have noticed the rotating banner images at the top of our webpage all have the same two ravens in them. We chose ravens because at nearly every site in the National Park Service (NPS) system, they are the one wildlife species that shows up regardless of the ecosystem or climate. Tiffany and I have seen these intelligent scavengers at Denali in Alaska, Death Valley in California, Smoky Mountains in Tennessee, and everywhere in between. 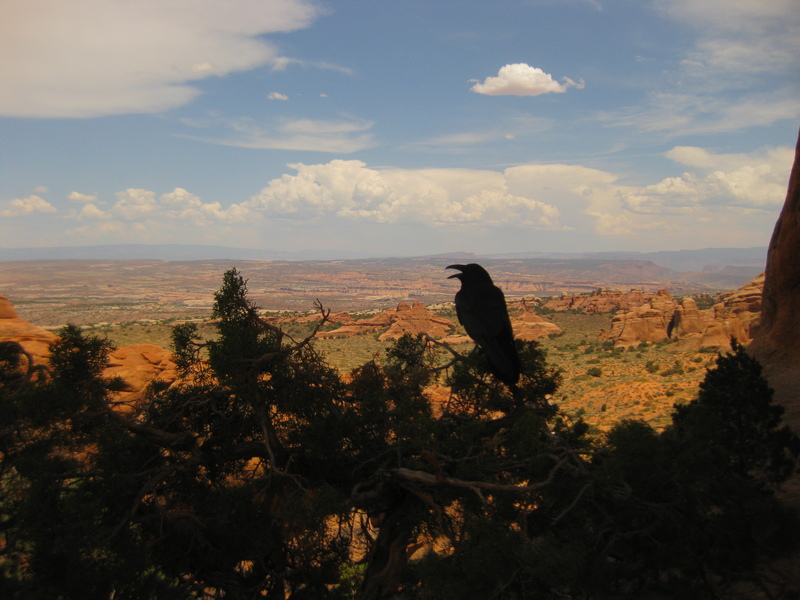 My favorite experience occurred at Utah’s Arches National Park, where a raven was cooling off, openmouthed in the shade of Partition Arch (“Parti” is memorialized on one of the banners). We have long considered ravens to be unofficial NPS ambassadors, so we had to select them as the symbols for Our Pretirement Account. For years we have photographed our raven finger-puppet (named Echo) at a variety of NPS sites, a tradition we plan to continue during pretirement and post under the “Raven About the Parks” header. How can we afford to pretire? So you’re probably asking yourself how we can afford to pretire? In a word: saving. We have made many sacrifices over the years to put money away for this endeavor. Our number one goal has been to stay out of debt. Through a combination of scholarships and steady paychecks we both graduated after 8 years in college without owing anything. We lived frugally for three years while we worked our first real jobs and rented a small house within our budget. Buying a bank-owned home that was a bit of a fixer-upper allowed us to avoid the need for a mortgage. Those were the big choices, but really it was all of the little daily decisions that added up over time. We love to travel and have not held back from exploring the U.S., but because we prefer to drive, camp, and cook we have even saved money there. In the future, we will blog all about our secrets to low-cost tourism. There is no magic to our financial success, though; it simply required sound judgment over time. Hi, this is Tiffany again, and I would like to extrapolate on what pretirement means to me. I define pretirement as a pre-established amount of time that is set aside to pursue what you are passionate about. The pretirement phase can be for following any dream; for us it is to travel and explore, especially when it comes to checking out the wild lands of the United States. It should be structured with specific goals and a vision. Although it is about passion, it is also a responsible decision that is highly thought out and only undertaken when finances are available. Pretirement is definitely not quitting work to lounge around, and it is never a last-minute decision. Pretirement can be more time/energy/emotionally taxing than simply staying with the current career path. Scott and I have been playing with the idea of a pretirement phase of our life since graduating from college in 2009. I am very excited to get started in 2016. We are not the first people to utilize the term “pretirement” and I think it means something different to everyone from early retirement to sabbatical to changing careers. In our minds, to pretire is a verb defined by taking a fixed amount of time off (10 months in this case) to do whatever we would want to do when we actually retire. Maybe this decision will require us to work an extra year or two at the end of our careers, but we both think it will be worth it for all of the memories we are about to make. To maximize our vacation time has required hours of planning and to afford the trip has required years of saving. We want to make the most of this unique opportunity by packing in as much fun as possible. I know our definition of fun can be very different from that of other people, so please take a minute to think about what you would do with a pretirement year.